For a recent birthday, I decided to treat myself to an Amtrak trip. Kathy couldn’t really take the time off from work, and I had accumulated enough free miles to earn a free round trip, first class ticket. So off I went to Ft. Worth, to ride the Texas Eagle to St. Louis. 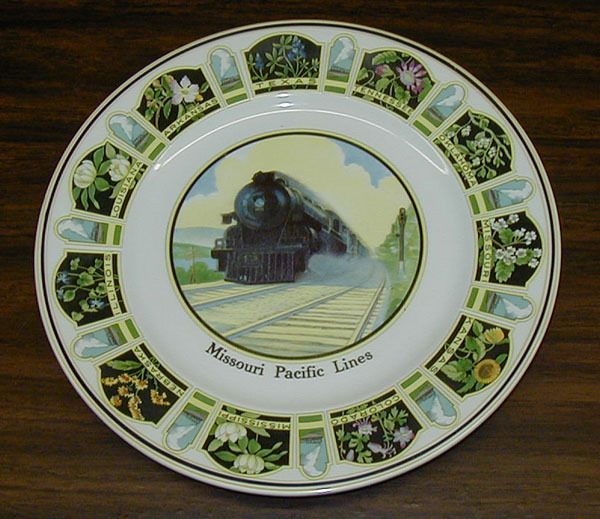 The Eagle is an old and honored name among passenger trains, first operated by the Missouri Pacific & Texas & Pacific system in the late 1940s. The MP/T&P operated a number of Eagles that radiated out from St. Louis to Denver, Kansas City, New Orleans, and other points across the system. The Texas Eagle went from St. Louis to Texarkana and Marshall; from there, you could take an Eagle to Houston, Laredo, San Antonio, Brownsville, or Mexico City. Other Eagles would take you to Dallas, Ft. Worth, Abilene, El Paso – even Los Angeles, if you made connections on the Southern Pacific. Amtrak’s Eagle runs from Chicago to St. Louis, Texarkana, Marshall, Dallas and Ft. Worth, then south to Austin and San Antonio, with connections eastbound to Houston & New Orleans, or westbound to El Paso and Los Angeles. The train coming up from Austin was about an hour late getting into Ft. Worth – not a good beginning! But since Amtrak doesn’t own its own tracks in this part of the country, it is generally at the scheduling mercy of UP, BNSF, and other freight-haulers. But I checked in with the conductor, who pointed me towards my compartment, and I settled in. Accommodations on an Amtrak sleeper come in various sizes. The “roomette,” which is what I had, is the smallest. It has two bench seats that face each other, and a sliding door for privacy. Cozy but comfortable, as long as you’re not claustrophobic, with restroom and shower facilities down the hall. Amtrak also offers bedrooms, family bedrooms, and bedroom suites, depending on a traveler’s needs, some with “en suite” restrooms and showers – see www.amtrak.com for more information. 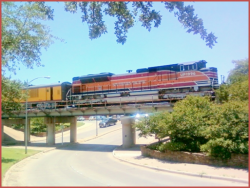 After the usual wait for servicing the train and loading passengers, the engineer gave the customary “Toot-toot” on the big locomotive’s horn, and we pulled smoothly out of downtown Ft. Worth. Until recently, pulling in and out of the Ft. Worth station required a complicated series of backup moves, crisscrossing through the Tower 55 interchange, and heading to Dallas on the UP through Arlington. Now however, the Eagle takes the more convenient route of the Trinity Railway Express commuter train (formerly the Rock Island line) through Richland Hills, Hurst, and Irving, on its way to Dallas Union Station. 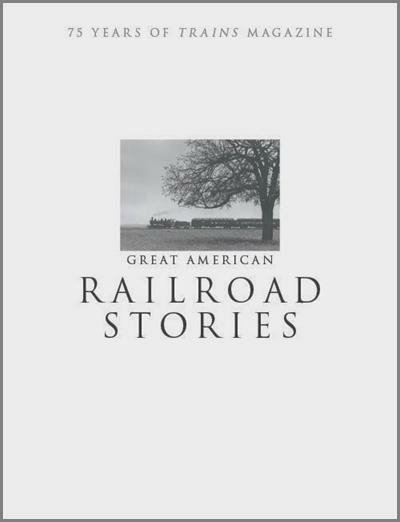 As we pulled into Dallas, the conductor announced that he was hoping to make up some of the time he had lost earlier that day, and warned any passengers getting off the train at Dallas for a smoke break, to stay close to the train and ready to leave at short notice. Sure enough, we weren’t there very long before two more short blasts on the horn announced our departure, and we were gone, heading east past Deep Ellum, Fair Park, and into Mesquite and Terrell. 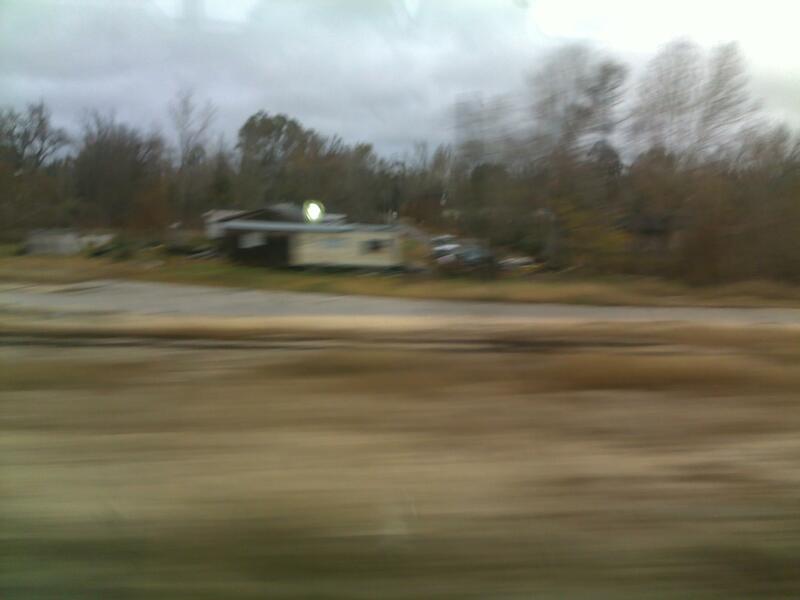 Heading through these residential areas, I was reminded of the interesting experience that often accompanies train travel: looking out your window into people’s backyards – some well-kept and inviting, others filled with piles of junk and forgotten, half-finished projects. You see plenty of both kinds, and everything in between. Then it was into the beautiful woods of East Texas, which at the time were just beginning to put on their autumn colors. Now and then we’d pass a rural homestead, often with tractors and other farm equipment parked around the place. Going by homes like that, I can’t help but wonder about the people who live there. What is their life like? What are their delights, and their struggles? Are they happy? Do they want to ride this train when they hear it going by? Train travel always makes me thoughtful. I woke up the next morning, just after daylight. It was a cool, gray, cloudy & drizzly morning. We had crossed through Arkansas, and were just outside of St. Louis, awaiting clearance to pull into our spot – we had made up that hour, and were actually a few minutes early. I headed down the hallway in my pjs to the coffee pot – another “perk” of riding first class, complimentary coffee. A few minutes later, I got dressed and went back to the dining car for breakfast – scrambled eggs and bacon, with whole wheat toast. We pulled in and stopped. I tipped the waiter, went back to my room, and grabbed my luggage; from there, I headed out to explore St. Louis. When someone finds out that I’m a model railroad aficionado, most of the time, it brings a sort of tolerant half-smile. That changes at Christmas. 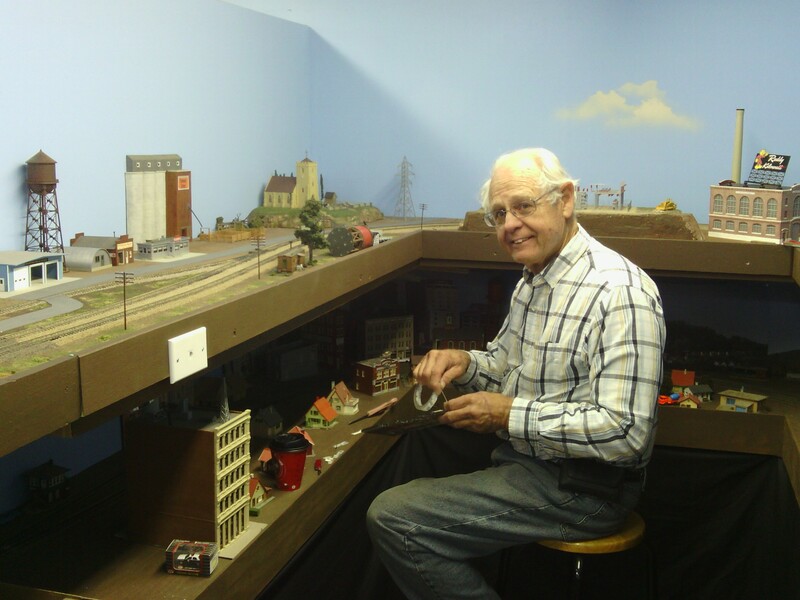 Tell someone you’re into model trains at this time of year, and their eyes will invariably light up, and they’ll say, “Oh, that’s so cool!” And you’ll hear a great story about a parent or some other loved one, a long-gone Lionel or other train set, and some wonderful memories. Even people who have no interest in trains the rest of the year, become nostalgic and even wistful thinking about trains around a Christmas tree. 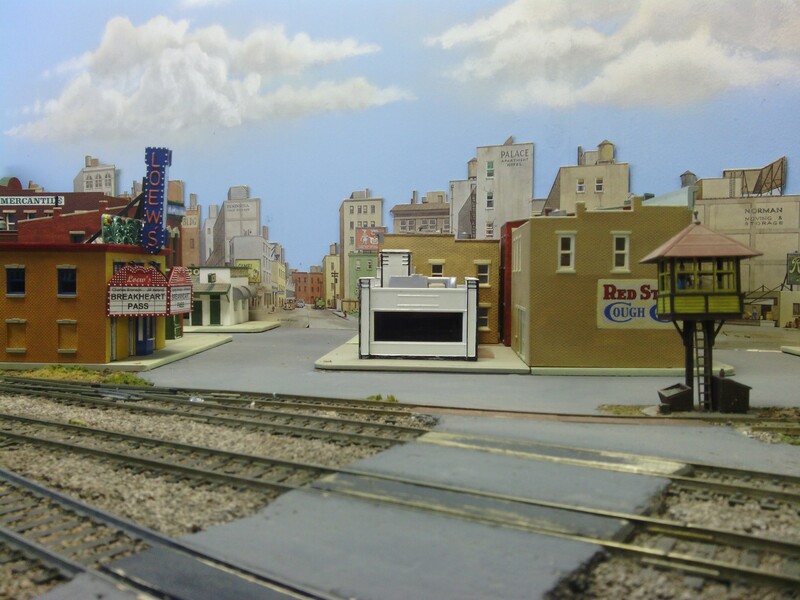 The club layout is in HO scale (pronounced “aitch-oh”), which is based on a proportion of 1:87 – in other words, 1 foot on the layout represents 87 feet in real life. (Yes, that’s an odd number, and there’s a story behind how it developed that I won’t bore you with right now.) 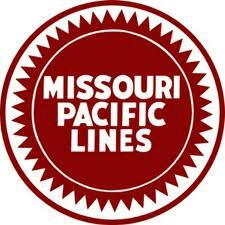 The club is seeking to represent the old Texas & Pacific Railway (now Union Pacific) from Ft. Worth through Abilene and on to Big Spring – although club members are allowed to “freelance” sections to reflect their personal interests. 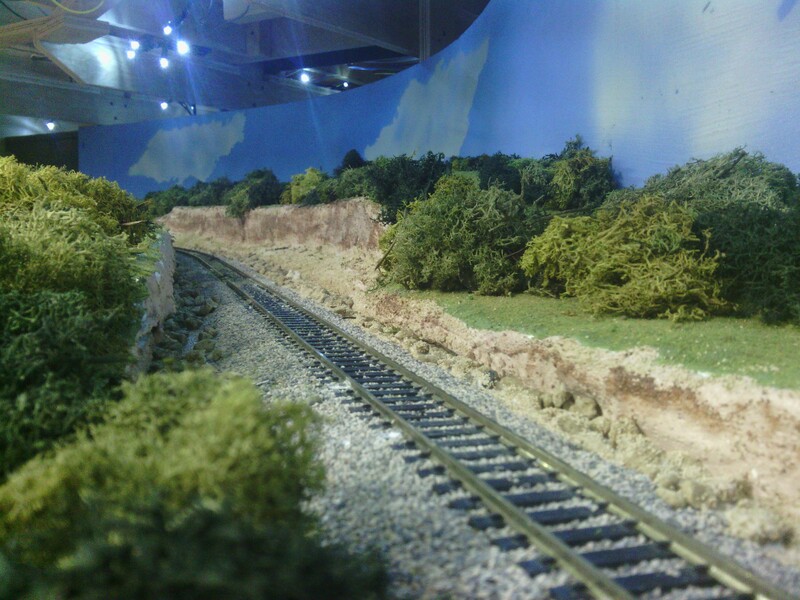 I have been adding to the scenery on a 20 ft. section of track, representing a rural area somewhere in Callahan County; other club members are doing sections that represent Abilene, Baird, and elsewhere. The scenery is finished in some areas, partially done in other areas, and not even started in some portions. There are many different techniques for creating realistic scenery. In my case, I used blue Styrofoam insulation board, stacked up and carved to represent ridges and hills, then covered with a thin layer of lightweight plaster. I painted it and sprinkled a product that represents grass, then placed lichen in various shades of green to represent trees. I am pleased with the final results. <– A downtown city scene. 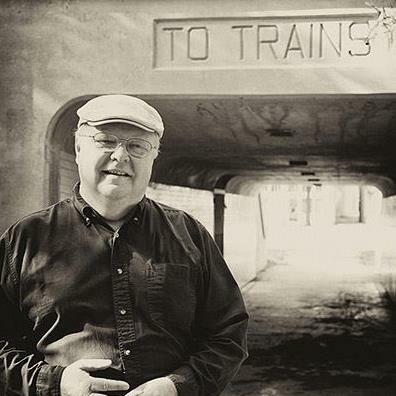 Do you suppose patrons at the movie theater complain about the noise when a train goes by? <– The T&P station in downtown Abilene. <– Member Mel Herwick adds details to a section of scenery. 1. When did the Abilene club begin? 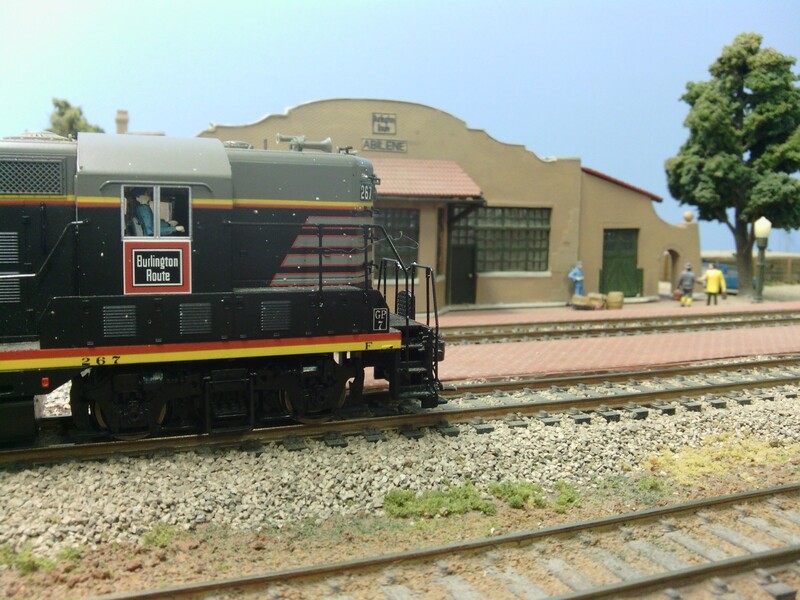 Our club started in 1991, partly in connection with the Abilene Railroad Festival which also began that year. 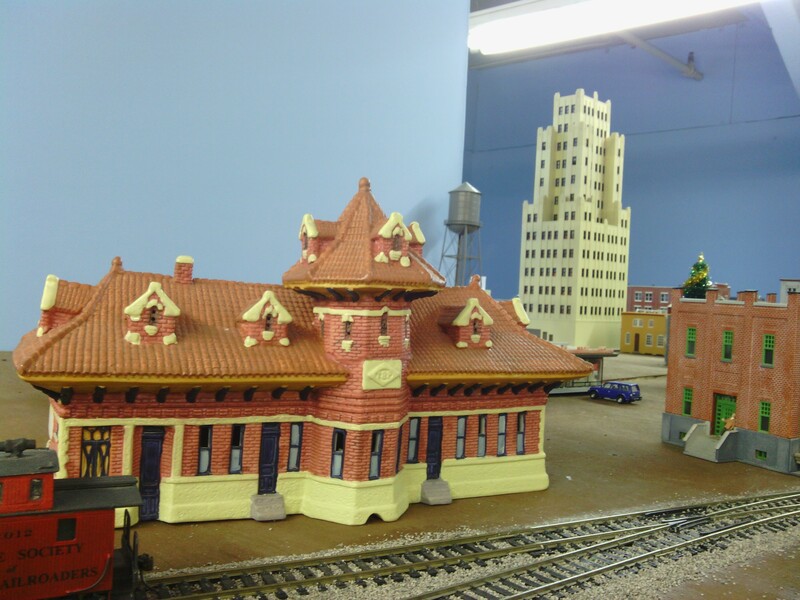 The railroad festival is no longer being held, but our club continues to go well. 2. How long did it take to build the layout? 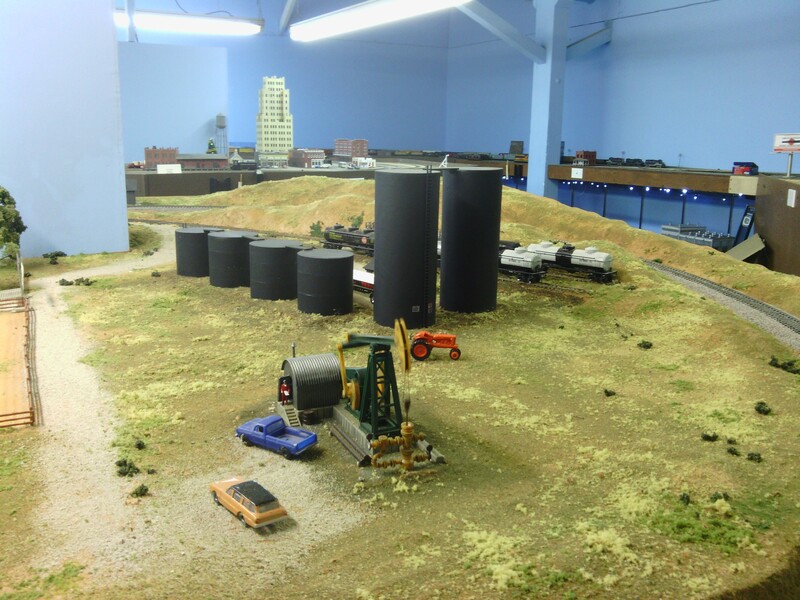 The current layout was started a little over two years ago, and is a little over half completed. At some future point we plan to expand our area. Once that’s done, it will be a matter of adding more scenery, and improving what has already been done – there’s a sense in which a model railroad is never finished. 3. Isn’t model railroading expensive? Well, it can be – you can spend hundreds of dollars on one engine if you want – but it doesn’t have to be. Speaking for myself, I certainly don’t have the funds to build a large layout, or the time, space or expertise, for that matter. But by being a member of the ASMR, I can have access to a great layout that I would never be able to afford to duplicate at home. I have also made some great friendships and my fellow members are happy to share their time and experience with me. As with any hobby – fishing, quilting, golfing – how much you spend is up to you. 4. What about other sizes of model trains? One of the first things that newcomers to the hobby must decide is what SCALE they want to model. As mentioned, the club models HO scale, which is the most common, and has the widest selection of engines, cars and model buildings available. A good beginner’s layout fits well on a 4×8 sheet of plywood, which is another reason it’s so popular. 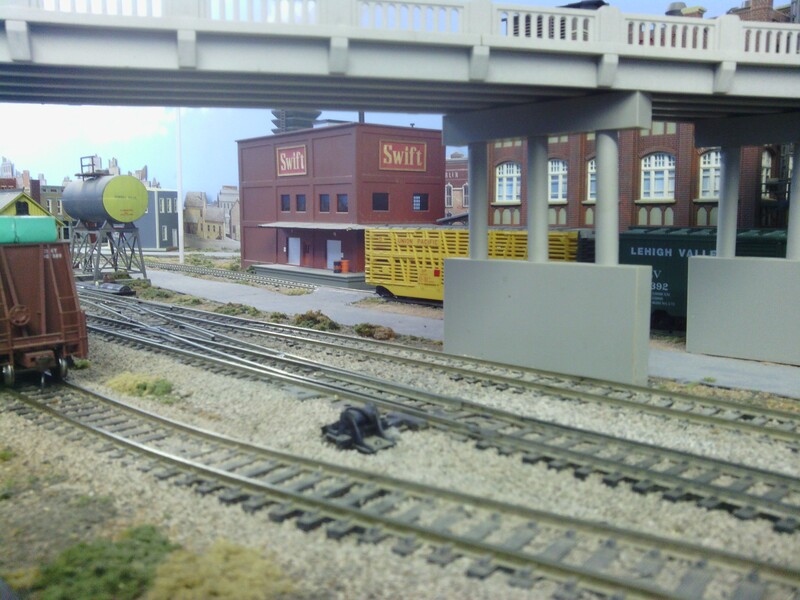 Other popular scales include N scale, which is smaller – a 3×5 size beginner’s layout works great – and also O scale, which is derived from the traditional Lionel trains that so many older folks grew up with. And there are others. 5. How can I get started? Many people begin by buying a train set at Christmas; that may or may NOT be the best thing, depending on the age and interests of the person you’re buying it for. For younger children, a wooden “Brio” style may be a better choice; for older children (or grown-ups), a set that includes an engine, some cars, track and a transformer, often for around $100, might be a good choice. Most sets will be either HO or N scale; it’s your choice which one you get. 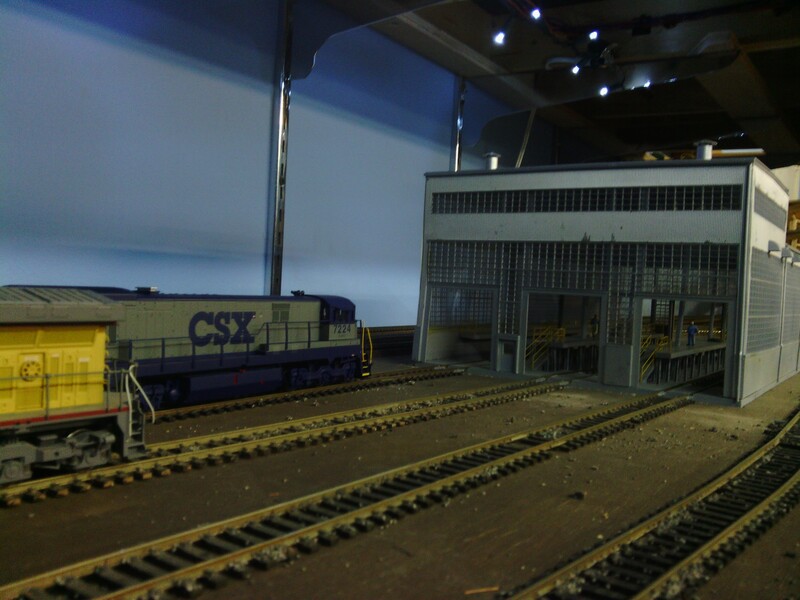 HO sets take up more room but are easier to put together and often easier to operate; N scale sets are more compact, but are less forgiving of bumps in the track and other beginner mistakes. If you decide to buy a set from a “big box” retailer or craft stores, don’t expect much help. Traditional model train stores can be more helpful for beginners, but also more expensive and sometimes hard to find. But there are PLENTY of online resources, and several good hobby magazines that can be very helpful. There are also lots of “how to” videos you can access for free on YouTube.